If you are a pet owner, there are a great many sacrifices you will happily make in return for the unconditional love, companionship and sheer joy that you receive from your cat or dog. Alongside unpleasant tasks such as having to take your dog for a walk when the weather is foul, emptying out litter trays and seeing your slippers chewed or your furnishings scratched is the simple fact that, if you are a pet owner, you’re going to have to spend a lot more time cleaning up. Read on for a few tips on how to stay on top of the task. If you haven't yet welcomed a pet to your home and you want to limit the amount of cleaning up you'll have to do, choose both your breed and your furnishings with care. When it comes to choosing a fabric for your couch and other furnishings, bear in mind that in addition to fur, you're also going to have to deal with other bodily fluids, especially if you take on a kitten or a puppy. Leather is a good all-round material that is always easy to clean. Avoid silk as this will stain easily and stay away from velvet as this is something of a magnet for pet hair. If you have the chance to choose a specific breed, pugs, labradors, huskies and golden retrievers all shed significant amounts of hair while poodles and Pomeranians don't shed at all. In the case of our feline friends, Russian Blues, Siberian and Burmese cats all shed minimal amounts of fur while Bobtails, Curls and Chartreux cats are among those breeds known to shed more than the average amount of fur. If your dog or cat has an accident and you end up with urine on a carpet or rug, you need to act fast. The longer you leave it, the worse the odor problems are likely to become. This is mostly due to a buildup of bacteria but also the fact that the urine can seep into the sub-floor, whether it is wood or concrete, meaning the smell will continue to linger even if the carpets have been thoroughly cleaned or even replaced. You may be tempted to use bleach to clean up pet urine, but this is not a good idea. Although bleach is a powerful disinfectant, it will not actually remove the unpleasant odors. 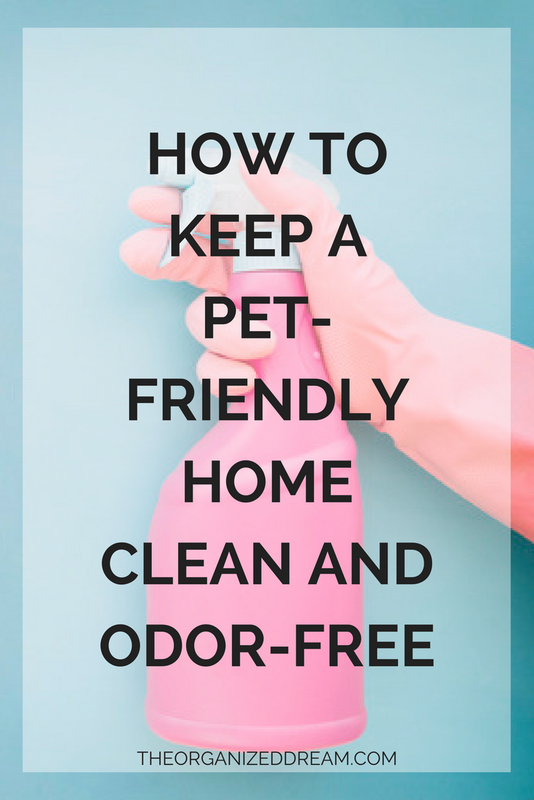 All you will achieve is to add the odor of bleach to your existing odors and make it more difficult for both yourself - and your pets - to breathe. The key component of pet urine is its pungent smell of ammonia. For this reason, you should avoid attempting to clean up using ammonia as you will simply make the smell worse. You should also take care not to mix bleach and ammonia, as this will create highly toxic fumes. The most effective products to use to clean up cat or dog urine odors are enzyme-based products that both neutralize the smell and break down the bacteria at the same time. These specialist products are widely available at pet stores. Use the product to saturate the problem area and then follow the manufacturer’s instructions. In many cases, more than one application may be required. If the urine has soaked completely through the carpet, be sure to pull it up and treat the area underneath at the same time. As an animal lover, it's a fact of life that you'll be spending a significant amount of time dealing with pet hair. You'll find it on the floor, on the furniture, on clothing, on bedding and, of course, all over the car. If you want to avoid getting overwhelmed with the issues, get into the habit of brushing your pet each and every day. Even if you only spend a minute or two on this, you will see a substantial reduction in the amount of loose hair you find around your home. It's also important to ensure you clean your home using a vacuum cleaner specifically designed for pet owners. Regular machines simply aren't up to the job - hair clogs their filters and jams up their brushes. Worst still, cheaper models that have leaky suction chambers means that a portion of the dust and allergens are just being spread around rather than cleaned away. Pet hair models will have filters that remove all the micro allergens, are versatile enough to get into all the corners and small spaces where pet hair can collect and are powerful enough to tackle even the biggest fur balls. Another reason to pay a little more is the fact that you'll need to clean a little more than a regular homeowner, so you want to ensure your machine is reliable. As well as keeping your home clean, it’s also important to keep your pet free from infestations of parasites such as fleas and lice. You can find a range of products suitable for both dogs and cats from companies such as PetAction. In addition to treating your pet, you’ll also need to treat your entire home or risk the infestation returning a short time later. This is another reason to wash bedding and other items associated with your pet on a regular basis. Should any flea eggs be caught up in the folds of the bedding, they could survive treatment and lead to a fresh infestation. An issue peculiar to dogs is that they will often try to roll in the feces of other animals - especially foxes - along with any other strong smelling disgusting substance they can find. They do this due to an instinctive desire to mask their own scent with more powerful smells. Be vigilant when you are out working and warn your dog off at the first signs of showing interest in a potential rolling spot. The last thing you want is for such a smell to be brought into your home and transferred to your furnishings. A common home remedy is to sprinkle baking soda liberally over the affected area and let it sit overnight, so it has a chance to absorb all the odors. You then simply vacuum up all the baking soda the following day. While this will definitely improve the situation, it will not work as well as the specialist products that are available on the market. In the short term, you may choose to use a perfumed product to cover up the smell, but if you do so, make sure the product is safe for animals as some essential or scented oils, spray and plug-in deodorizers can be harmful to pets. If you are too late, remember to wash your dog's collar as this too is likely to be covered in the same stinky material. The same goes for your pet’s bedding. This should be washed at least once each month.